This all started with me thinking I could use up a bunch of Schaefer Yarn's Laurel I had in my stash. Then, of course, they needs coordinating solids, so when I was in Florida last week I HAD to go to the yarn store(s) to find the perfect matches. 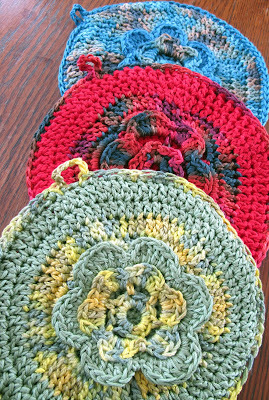 The blue and green potholders use Paton's Grace (held double)and the red one uses Reynold's Saucy. I ended up trying a few different designs, and in the end was the most happy with this flower motif that I got from this book. 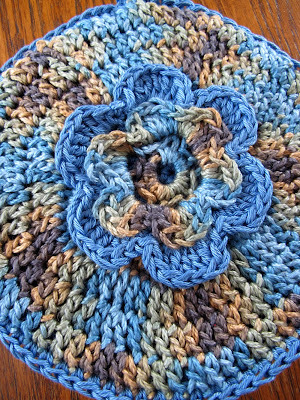 I modified it some and then backed them with a single crochet circle so no hands can get burned. #27- Sparkle and #13 Deborah. I don't have contact info for either of you, so PLEASE get in touch with me by the end of the weekend. If I don't hear back I'll choose another winner. I think I may be the Deborah? deborahbourque@gmail.com? Awesomeness! They're gorgeous. I'll bet you're ready to move on to something else, now, though. 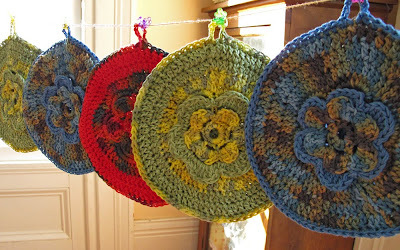 That's a lotta potholders!